I’m not a morning person. It’s hard for me to get inspired and motivated, especially on a Monday that follows a sunny, active weekend. 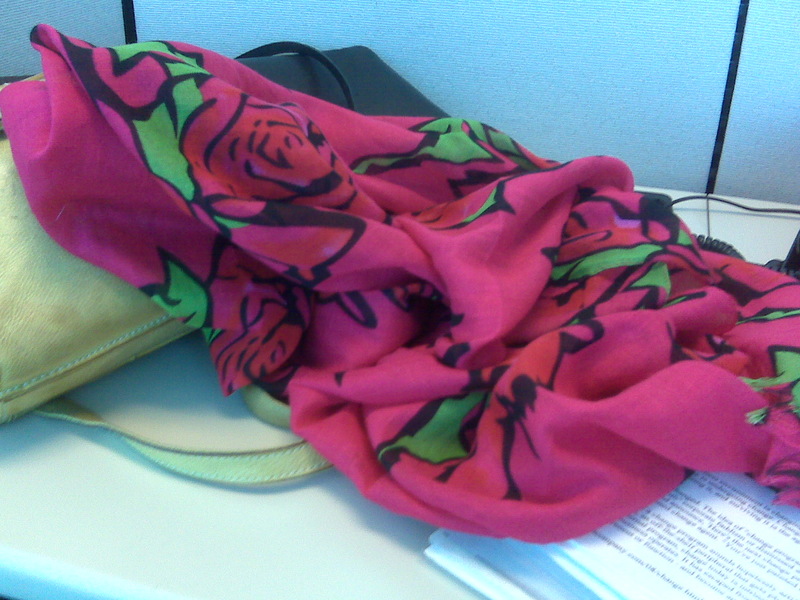 Just now I was about to dig into my career transition “to do” list, when I couldn’t help but notice how beautiful my new scarf looked, casually draped over my purse and briefcase the way it landed when I put my stuff down on the desk. I bought my new favourite accessory on Friday — it was a cheap and cheerful impulse buy (yes, TR, I am still an active impulse buyer!). I was walking by a tiny store in the underground concourse at Bloor and Yonge and my eyes went directly to it. I felt happy just looking at it. When we recognize moments of inspiration, it opens up possibilities that lead to options, that lead to baby steps, that inevitably add up and lead to achievement. I fondly remember seeing that wonderful scarf just yesterday. And I have to say, you looked positively radiant!